Welcome to our beautiful holiday home, We are very pleased with our Bungalow. The 2 Double Bedrooms have fitted wardrobes 1 with a king size bed. The plug sockets are UK 3 pin standard. We provide a hairdryer for your use and dressing table with mirror in the main bedroom, air condition unit, Radiator for the cooler months and ceiling Fan. The main bedroom leads to a patio area at the rear of the property.The 2nd bedroom has 2 large single beds Air condition unit,Ceiling Fan and Radiator for the cooler months. The bedrooms are located at the rear of the property and accessed through a door leading off the lounge. The open plan lounge/ dining room is fully furnished with patio doors leading on to the Beautiful large outside area at the front of the property overlooking the swimming pool. An Archway will lead you to the fully fitted kitchen where you will find everything you need to have a wonderful home from home experience in sunny Cyprus. The facilities available in the kitchen include dishwasher, washing machine, oven & hob. Iron & ironing board and all kitchen utensils. If you would prefer to dine outside we also provide a barbeque and an outside dining area for you to socialise and enjoy your evenings. The Bathroom has a good size double shower, storage space, wc and washbasin. The Villa is Air conditioned, Double Glazed, Central heated, with a feature Electric fire,A flat screen tv with Free WIFI and a Dvd player is also available for you to enjoy. 4 sunbeds, outside shower,Bbq, and of course the Lovely 8m x 4m Kidney shaped Private Pool. The Beautiful Gardens are well kept and cleaned on a weekly basis as is the Private Pool. Villa Lamda is located in a small peaceful area Approximately a 15 min stroll down the hill to the lovely Village Square, where you will find a selection of Tavernas, bars, local Supermarket,Bank,(although a 10 min Drive will take you to larger supermarket where you will find everything you require including Meat, Fruit, and lovely, fresh, warm Bread and Rolls). Bedding, Towels, and Pool towels are provided. We also have a rotating washing line at the rear of property for your use. The property will be cleaned prior to your stay and if you require a cleaning service during your stay this can be arranged and paid for at an additional cost to yourselves. Local car hire is also available at reasonable rates. Airport pick up and drop off can be arranged and paid for by yourselves from either Paphos or Larnaca prior to your stay. We are a family of four. We live in the UK and enjoy holidays in Cyprus. We discovered the Beautiful tranquil village of Pissouri 5 years ago when we stayed in the village for 10 days. We have been holidaying in Pissouri ever since and when we discovered this Villa for sale we knew this was the one for us. The villa is located walking distance to the village square. 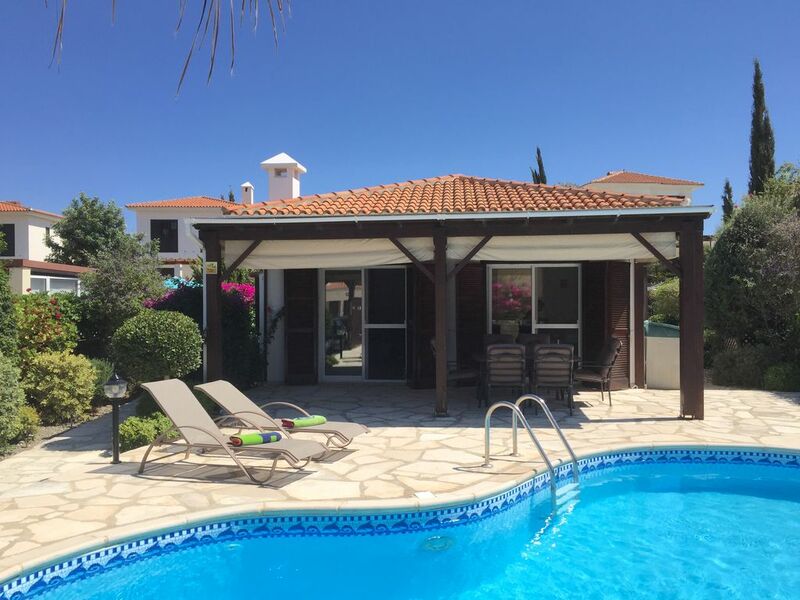 The villa offers a home from home experience with the added advantage of the the air conditioning in the summer and central heating in the cooler months. Pissouri is located central to Paphos and Limassol with a 30 minute driving distance to either area. The villa is situated 15 minutes walk to the village square. We are a 10 minute drive to Pissouri bay where there are a number of bars and restaurants, the beach with various water sports and a few tourist shops. This property is located in a quiet residential area where your neighbours are a mixture of residents and holiday makers. We fell in love with the location of the property as you are close to local amenities but set back so as not to feel you are in a busy area. The area is peaceful and tranquil. The swimming pool is enclosed at the front of the property surrounded by the beautiful gardens. The patio area has an outside shower, dining area and sunbeds. The dining area is undercover so you can enjoy your meals and drinks even in the hot temperatures of Cyprus. The property is open and spacious and also has an inside dining area. Everyone who has visited the property has commented that this is a perfect villa for a family of 4. Villa Lamda is a lovely, well appointed villa, equipped with everything you could need for a relaxing holiday. We stayed for the middle 2 weeks of March and apart from a day or so of rain at the start of our holiday, the weather ranged from warm to hot. We even managed a dip in the pool. We Are Just Pleased You Had a Lovely Time . All The Very Best To you Both . Whilst quiet and peaceful location not isolated within walking distance of beautiful village. Sooo Pleased You Enjoyed your Stay . A well appointed & presented villa which is set in a peaceful location. The outside area which includes a welcoming pool in the heat, is complimented by a sheltered dining/rattan seating area. The BBQ is amazing as you can alter the height of the grill: my husband fell in love with it!! There are also some lovely local restaurants providing local fayre or something a little more upmarket. Our favourites were Steakhouse by Michael, for which booking is a must and Melandra Bay restaurant which overlooks the sea. We had freshly caught sea bass which was to die for. Booking at weekends in particular are a must. Both of these were recommended by Dave the poolman who lives just up the road, who is on hand if help is needed. There is a local supermarket which provides everything you need for your stay. Thank you Steve for answeing all of my questions & for letting us stay at your beautiful home. Thank you So much And so Happy you Enjoyed your Stay . Couldn't of wished for anything more in this lovely villa. Beautiful outside space for dinning and amazing pool . Fantastic holiday. Thankyou steve for all the infomation you gave us . Lovely to hear you Enjoyed it . A most beautiful villa in a great location! Villa Lamda is on the outskirts of pissouri village which is approx a 25minutes taxi ride from Paphos airport. The villa itself is very well equipped and pristine but the pool and garden just complement it perfectly. You will not be disappointed with anything to do with this holiday. It is one of the easiest and most relaxing of holidays I have had. The local beach is only 10 minutes away in the car as is also, a well stocked supermarket. Steve has always been most responsive to any of our enquiries and takes pride in ensuring you have a good time. We Are So Pleased You And Your Family Enjoyed Your Stay. Visited this villa as a family of four with a 4 and 2yo. They loved the pool, which was a perfect size, lovely and warm. Great location for walking in to the village, about 20 mins, hired a car too for trips further afield. Villa has everything you might need, owner very helpful, can't fault it. Have stayed in Pissouri many times but this is my favourite villa and hoping to book again next year. So Pleased you Enjoyed it there . also many other Attractions, Aphrodite's Rock the Curium ruins and Beach 20 min drive, and many more , just ask .